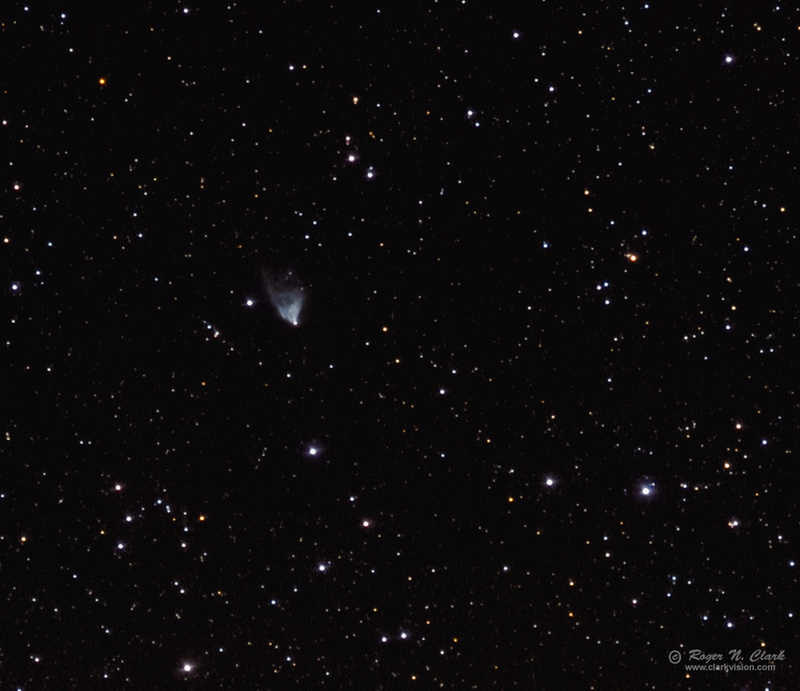 Hubble's Variable Nebula in the constellation Monoceros, shows time varying structure apparently due to shadows cast by dense clouds near the star at the apex of the nebula in the image above. The blue color is light scattered from dust grains smaller than the wavelength of visible light. Its distance is about 2.5 light years. It is a small bright deep-sky object visible in small amateur telescopes. I have a drawing of it in my book Visual Astronomy of the Deep Sky made with an 8-inch telescope. This is a natural color image. Technical. This image was obtained with a Canon 7D Mark II 20-megapixel digital camera and 300 mm f/2.8 L IS II lens plus a 2x teleconverter giving 600 mm at f/5.6, ISO 6400 and 1.4-arc-seconds per pixel. Note: the ISO 6400 was a mistake--I forgot to change the ISO after focusing. I had intended to make this image at ISO 3200. (Note: ISO does not change sensitivity.) Resolution is limited by seeing, atmospheric turbulence during the imaging session. Exposure time was 30 seconds per image with 20 frames obtained in a bright green zone on the light pollution scale. Total exposure time = 10 minutes. No dark frame subtraction, no flat fields. Tracking with an Astrotrac and no guiding. I elected shorter exposures because wind gusts were occasionally shaking the setup and I selected the best set of images from a longer time period. The image here is sampled at the full pixel resolution of 1.4 arc-seconds per pixel. Post processing this small object required different methodology than I have usually done. Stacking many images had to be very accurate or spatial resolution would be compromised. Accurate alignment is the Achilles Heel of multi-exposure astrophotography. I have found stacking software often is poor, destroying fine detail (look for a future article about this in my astrophotography series). To make this image I did the following. I first aligned the images with translate only using ImagesPlus. That aligned the images to about a pixel. Then I fed that result into Deep Sky Stacker, turning off all calibration, and using 2x drizzle, which enlarged the images 2x. That aligned the images to 1/2 original pixel. The result was a well aligned stacked image with 0.7-arc-second per pixel sampling. The 10 minutes of exposure produced a high signal-to-noise ratio image for this relatively bright object, enabling Richardson-Lucy deconvolution to improve resolution mitigating the degradation from poor seeing. The deconvolved image was then adjusted for color using spectral classes of stars to guide color balance to make a natural color image. CEFA = 1760 minutes-cm2-arc-seconds2 (1.4 arc-seconds / pixel).